The NRG is sponsoring a follow up forum on Carolina North August 29th, 7-8:30pm at the Chapel Hill Library. The CHPL meeting space is quite a bit tighter so get there early. Direct link to June NRG forum. regulatory process surrounding Carolina North, and how citizens can effectively give input. J.B. Culpepper, a Chapel Hill Town Council member, and citizens experienced in public action. As at our June 4 forum sponsored by NRG, we plan to reserve a large amount of time for questions and discussion. The earlier forum was well-attended, as it appears Carolina North is about to get started, I hope our fellow citizens attention is as well focused. Being in government has its advantages. Concerned citizens trying to get a good baseline on the cost of adding a bus route through the Rogers Road community didn’t net a response in 2005 (I know, I took a stab at it 2 years ago when I ran for Town Council). Ahh, but if you’re a Carrboro Board of Alderman member, like Dan Coleman, running for office – presto, cost estimates nice and tidy. We have looked at the 2 options to serve Rogers Road via the HS Route that we discussed. If we continue to run 1 bus but extend it north on Rogers Road 15 minutes travel time would be added to the route. Service frequency would drop to 45 minutes. Daily platform hours would be 5.9 hours daily. There would be no change in the current operating cost. When a second bus is added and the route is extended to Rogers Road the service frequency improves to 20 minutes. Platform hours would increase to 9.3 hours daily. The additional 3.4 hours would cost $202 daily or $52,800 annually. Further analysis here [XLS: FIXED LINK, thanks Terri]. 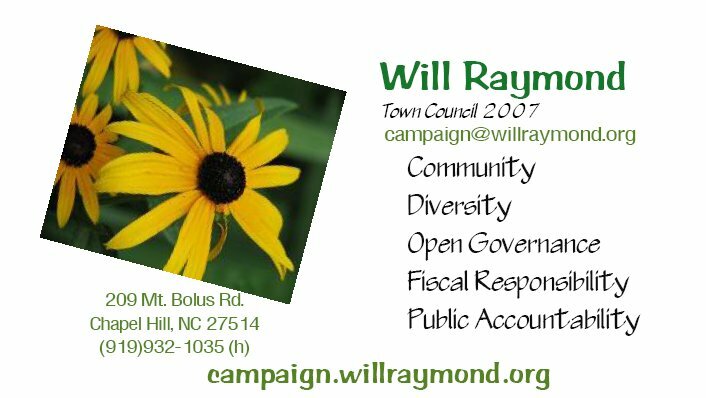 In 2005 I wanted to see service not only passing through the Rogers Road community but work as an element of a greater plan, sans annexation, to integrate the northern reaches of our greater community into Chapel Hill/Carrboro’s economic, social and educational life. Since then, we’ve spent $949,025 of Federal monies on the digital notification NextBus system (which is reported to expand this Fall at a cost of ???). Wouldn’t $53,000 , if that’s an accurate estimate, spent servicing Rogers Road and adjoining areas be a better investment in our wider community’s future? The July 31st Carolina North community outreach meeting was supposed to cover the same ground as last week’s presentation to UNC’s Board of Trustees. While Jack Evans might have presented the same material, my guess is the community’s reception was somewhat less excepting than the BOTs. The 4pm session ran to 5:30 and was well attended by more than the “usual suspects”. I’ve attended every session on Carolina North these last few years but understand outside demands and the funky scheduling can make attending a burden so it was nice to see most every candidate – Cam, Sally, Jim, Penny – for Town Council show up. Some of the answers to the community’s questions were quite telling – in a sense more informative than the session itself. The disposition of Horace-Williams is going to influence the next 50 years of our Town’s development. We need leadership that is not only aware of the issues but can negotiate well on behalf of the citizenry. Towards the end of the video you might have some difficulty understanding the questions from folks in the upper bleachers but forge ahead as Jack Evans did a good job of reiterating and responding.